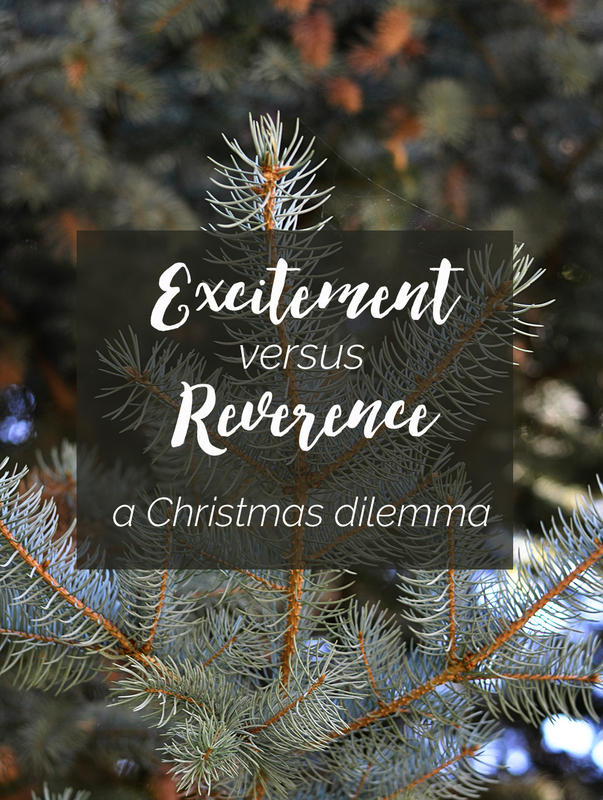 Excitement vs Reverence: A Christmas Dilemma - Real life, on purpose. My kids are at pretty much the perfect ages for a MAGICAL CHRISTMAS. Mila is old enough to have expectations and strong opinions about what we should or should not do to have the “perfect” Christmas. Margot gets sparkly-eyed anytime she sees Christmas lights anywhere. Just stopping into a home decor store last week sent her into raptures about how beautiful everything was. Ryan belted a semi-unintelligible version of Jingle Bells from his crib for 20 minutes before he fell asleep last night. Right now, everything is exciting to them. And I love it. I do. Our house is overflowing with handmade snowflakes and crayon drawings of Christmas trees. We listen to Christmas music almost nonstop. David put lights on the house last weekend and next week we’ll go pick out the perfect live tree. Over the next few weeks we’ll have enough sugar cookies, cinnamon rolls, and candy canes to satisfy a small army, I’m sure. But as fun as jingle bells + Elf + rocking around the Christmas tree + Santa Claus + ho ho ho + mistletoe + presents to pretty girls are, that’s not what Christmas is really all about, is it Charlie Brown? With young kids, I’m often tempted to let go of any sense of reverence and allow the excitement to run its course. Excitement is more fun. It’s certainly easier. But I’m playing the parenting long game. Every choice I make has a consequence. And choices that are fun + easy don’t often lead to consequences for my children like goodness + lasting joy. Not that there’s no place for fun. If anything I’m trying extra hard to appreciate how delightful these little beasties are, knowing full well these moments won’t last forever. However, in all the fun + excitement, I also want to be sure I’m showing them that there’s a time and place for restraint + reverence. It’s a challenge for sure. I’m trying to find quiet pockets of time to be present with them. We read stories or just chat. I try to shift their attention away from receiving and toward gratitude and giving. We snuggle a lot. I’m not mad about it. We’ll probably go visit Santa at some point in the next couple weeks. Meanwhile, we’re also doing a small devotional each night where we read scripture and learn more about Jesus. We’ll go to Christmas parties that are loud and crowded and so much fun. Hopefully we can also go to Christmas events that are more focused on the sacredness of anticipating the Savior’s birth. It’s about finding a balance. Isn’t that what parenting, holidays, and life in general are always about? Tell me, friends: how do you balance the excitement and reverence of the season? Thanks for linking/liking my post! Those were a lot of fun to write about, and I’m glad other people enjoyed reading about them, too. I was a little sad when you didn’t start posting new ones December 1. They’re among my favorite things you’ve ever written. I have this amazing Christ Centered Countdown that I got this year and it’s honestly been a bit of a breexe with balance. It talks about the story of St Nicholas and each night is an activity with a scripture so you’re doing both fun and spiritual every night. Like last night the activity was to read a Christ centered Christmas story under the Christmas tree. Another is to have a birthday party for Jesus and “give him a piece of us” as our gifts. I really like it and Rory has loved it so much! That sounds awesome! Where did you find it? I may need to try it next year. Terrific message, Jen. A great reminder for us all.